What do you get when you take two creative brands, a shared love of bananas, and a desire to do some good? The Missibaba x Mami Wata Bananananananas custom surfboard bag. Missibaba and Mami Wata used their respective expertise in leather accessories and surf apparel to create the one-of-a-kind board bag that will be auctioned off in aid of youth surf therapy NPO Waves for Change. Funds raised will go towards building a new Waves for Change clubhouse in Harper, Liberia. 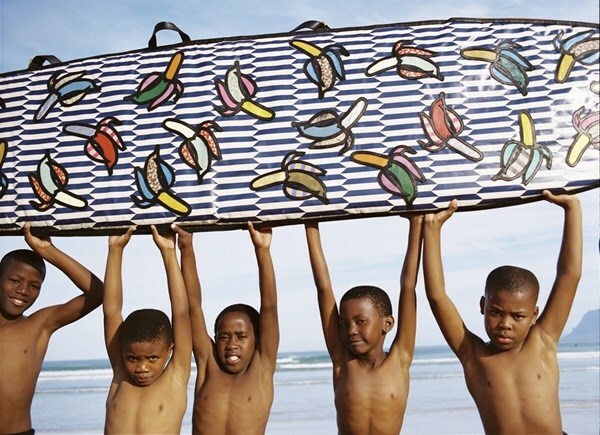 In July, members of the public can get involved by visiting the GoFundMe platform on the Mami Wata website where they can buy unique Mami Wata products, such as the first Mami Wata X Missibaba custom surfboard bag, as well as African surf experiences. The proceeds from every purchase via the GoFundme platform will go towards the construction and operation of the clubhouse. Missibaba’s Chloe Townsend and Nick Dutton from Mami Wata let us in on how bananas they are, how the bag will help Waves for Change and potential future brand collaborations. Tell us a bit about your partnership with Waves for Change and how you have been supporting this NPO thus far? Nick Dutton: Mami Wata and Waves for Change share the belief that the ocean heals and leaves you changed in mysterious ways. Waves for Change is an award-winning African surf therapy programme, changing communities around South Africa, Liberia and Somalia through the restorative power of surfing. 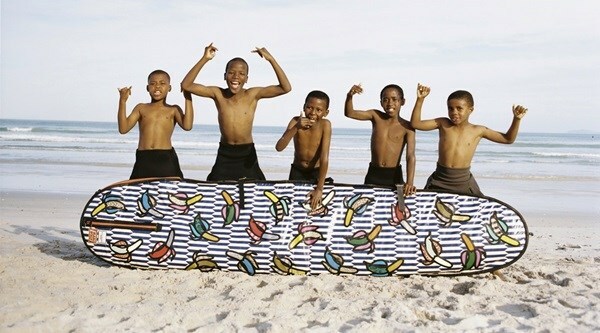 The work they do is truly exciting and inspirational, not just by sharing the joy of surfing with disadvantaged communities all over Africa, but also using surfing to alleviate suffering, spread good vibes and reinforce positive life choices in the communities they work with. Fulfilling our partnership with Waves for Change, Mami Wata will be dressing their coaches in our distinctive Mfazazana boardies, Mami Wata mermaid logo shirts and caps for the upcoming season. We’re also offering Waves for Change coaches and alumni opportunities for growth, experience and employment in the Mami Wata business. We’ve run a number of public fundraising events on behalf of the organisation and will continue to do this regularly in the future. We’re also working with this incredible surf therapy organisation to develop an original Mami Wata x Waves for Change surf coach uniform for all their coaching staff, but also for sale in Mami Wata stores and stockists, to raise awareness and funds for Waves for Change. The Mami Wata x Missibaba luxury board bag initiative is to raise funds for an exciting new project at Waves for Change in Harper, Liberia, where we’re helping to build the new Waves For Change clubhouse. How did the collaboration between Missibaba and Mami Wata come about? Chloe Townsend: Connected by our love of bananas, bold colour, and our motherland. We met up with the Mami Wata team early this year for one exhilarating mega brainstorming session, which resulted in our Banana dreamboat. Mami Wata’s enthusiasm for life and design is contagious and energising – we have loved working together to create this unique piece of art. As a surf brand, what was it that drew you towards Missibaba when you embarked on this fundraising initiative? Dutton: Bananas! Missibaba loves bananas. We love bananas. 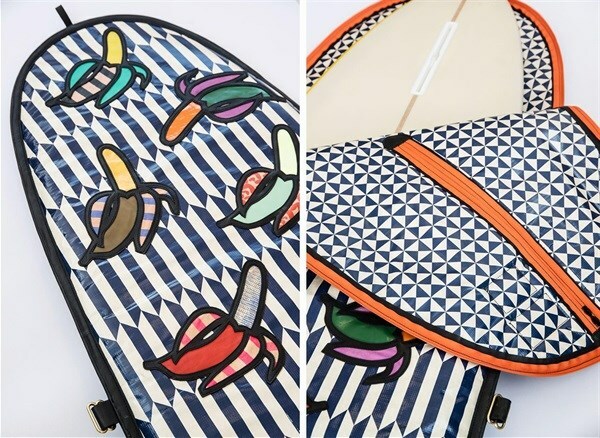 Which three emotions do you want the Bananananananas custom surfboard bag to evoke? Townsend: We hope the Banananananas board bag will stir a deep and joyful giggle, bring happiness and openheartedness. Tell us some more about the significance of the iconic Mami Wata banana motif? What has it been like branching out and designing this surfing accessory? Townsend: We have loved exploring the world of Mami Wata, a very large new canvas and new materials for our creativity to run wild. What’s the meaning behind the design of the bag? Townsend: Both brands are bonkers for bananas. It seemed the obvious choice of embellishment. We have combined our signature bananas to create a delicious and happy hybrid. The bold colours, graphic bag fabric and exotic textures echo the African roots of both brands. What was it that led you to conceptualise and produce this functional work of art? Dutton: Board bags are functional. It doesn’t mean they shouldn't look great or be much more than just a utilitarian sock for carrying your board to the beach and back. It felt like a great canvas to do something different and unique. How do you think initiatives like the Missbaba x Mami Wata surfboard bag collaboration help to grow fashion businesses? Townsend: Collaborations like this work wonderfully to broaden brand awareness and help tap into a new market. We feel it’s always good to step out of your comfort zone and rise to the challenge of a new canvas, a way of working, etc. It also helps to lift the spirits of all involved. Such a treat to work with such inspired and enthusiastic humans who’re working to bring some good stuff into being. How important is it for local businesses to support organisations like Waves for Change? Townsend: We feel it’s very important for everyone to come together in a joyful, generous and creative way to help lift, inspire and help each other. Can we expect more socially minded creative collabs from Mami Wata and Missibaba in the future?